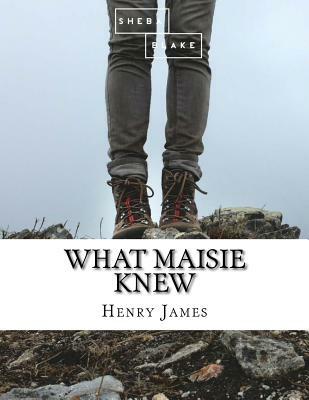 What Maisie Knew is a novel by Henry James, first published as a serial in The Chap-Book and in the New Review in 1897 and then as a book later that year. It tells the story of the sensitive daughter of divorced, irresponsible parents. The book follows the title character from earliest childhood to precocious maturity. When Beale and Ida Farange are divorced, the court decrees that their only child, the very young Maisie, will shuttle back and forth between them, spending six months of the year with each. The parents are immoral and frivolous, and they use Maisie to intensify their hatred of each other. Beale Farange marries Miss Overmore, Maisie's pretty governess, while Ida marries the likeable but weak Sir Claude. Maisie gets a new governess: the frumpy, somewhat-ridiculous but devoted Mrs. Wix. Both Ida and Beale soon cheat on their spouses; in turn, Claude and the new Mrs. Farange begin an affair with each other. Maisie's parents essentially abandon her and she becomes largely the responsibility of Sir Claude. Eventually, Maisie must decide if she wants to remain with Sir Claude and Mrs. Farange. In the book's long final section set in France, the older (probably teenaged) Maisie struggles to choose between them and Mrs Wix, and concludes that her new parents' relationship will likely end as her biological parents' did. She leaves them and goes to stay with Mrs. Wix, her most reliable adult guardian.